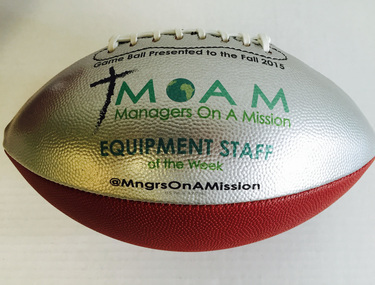 ﻿2016 EQUIPMENT STAFF OF THE WEEK - COMPETITION #1﻿. Competition:﻿ How many footballs can you shotgun snap in 1 Minute? 1. Set a pop up dummy 6 yards from a line. 2. Tape a line at least 4ft from ground on dummy. ​3. Kneel, and shotgun snap footballs at dummy as quickly as possible. ​4. You can use up to 3 managers, one to snap, one to shag the balls, and one to set balls down beside snapper. ​5. Submit video via twitter to @MngrsOnAMission using #ShotgunSnap and Total number of balls that hit dummy above the taped line in 1 minute. Submission Deadline: Friday, September 23rd, 2016.